Background: Chin implants are the oldest form of bone-based augmentation and still the most common facial implant done. While effectively providing increased chin projection it is really an isolated jaw augmentation that only changes less than 1/3 of the entire jawline outer surface area. For this reason there is growing interest in a more complete approach to lower facial augmentation. With an increased interest in a complete jaw augmentation effect the role of a custom jawline implant is increasing in aesthetic facial reshaping surgery. With the advantages of having a preformed design based on the patient’s individual anatomy and being made as a single piece, it offers numerous aesthetic advantages over three separate standard implants. A one piece implant does also help to lower the risk of implant asymmetry which is almost always in how the implants are intraoperatively placed. Many patients that present for custom jawline implants have an indwelling chin implant. (in my experience about 40%) For some the chin implant represents all that was available years or decades ago. 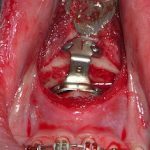 For others the chin implant was placed more recently either as their choice as that was all that they initially wanted or because that was all the surgeon offered. In either case such chin implant patients are ready to ‘graduate’ to a more complete jawline augmentation. Case Study: This young male presented for a total jawline implant after having had a chin implant placed almost a decade earlier. 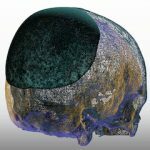 A 3D CT scan showed an indwelling split chin implant. Besides wanting extensions back to the jaw angles the goal was to also add more chin projection and width. Use of the existing chin implant dimensions helped guide the custom jawline implant replacement. His 3 monts result from the front view shows how different the effect on the lower third of the face when one graduates from a chin implant to a complete jawline implant. 1) Chin implants are often the predicate augmentation approach to an eventual complete jawline enhancement. 2) Having an existing chin implant helps determine what exact additional augmentation is needed for the front of the jaw. 3) A custom jawline implant design incorporates what has been learned from the existing chin implant to the entire lower jaw.